Description: Shell sculptured with strong spiral ribs, three on penultimate whorl and seven on body whorl; uppermost strongly beaded, others smooth or beaded. A single secondary rib present between some or all primaries on body whorl. Axial sculpture of close set ribs, between or crossing over spiral ribs, producing a latticed surface. Umbilicus closed or narrowly open; columella smooth. Outer lip smooth within. 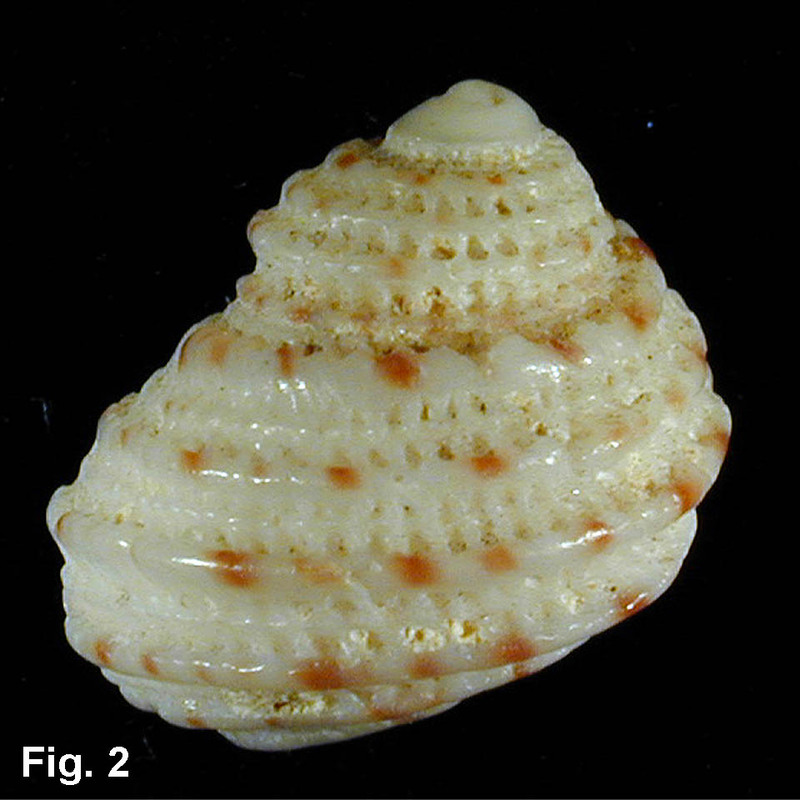 Colour white, with irregularly spaced reddish-brown spots on primary spiral ribs. 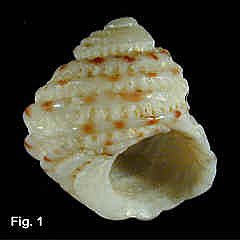 Size: Up to 15 mm high, usually less than 10 mm. Distribution: Endemic to Australia; recorded from Hope Is., Qld, through southern Australia to Broome, WA. Moderately common in northern NSW and south-western WA, but rare in Vic and SA. This is an unusual distribution, and suggests that more than one species is involved. Habitat: Mainly known from beach shells. Remarks: There is wide variation in sculpture in this species. Most specimens have a secondary rib between the primary ribs on the upper half of the body whorl, but they may be completely absent, or present between all primaries. Axial ribs may be restricted to the interspaces between the spiral ribs, or may cross over them, producing beads at the intersections.